"Dear daddy, I write you..."
Provided by Pens equipment manager Dana Heinze. 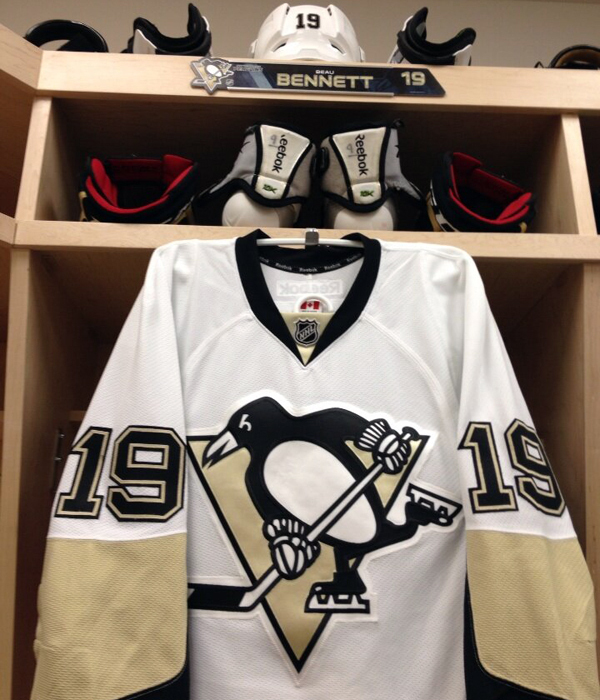 It is notable that Bennett makes his debut against Winnipeg, the home of his grandmother (Grandma Bennett). His grandmother and her sister moved the family to California, and she still lives in Cali in the same house to this day. This is Beau's first time in Winnipeg. 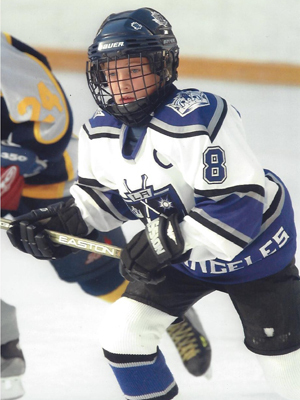 Grandma Bennett inspired Beau to play hockey by showing him pictures of hockey players from her time in Winnipeg. She will be watching tonight's game on TV. Beau also said that he was named after the "Bo Knows" Nike commercial campaign featuring Bo Jackson. Oh, the memories. (Apparently Bo doesn't know hockey, according to Wayne Gretzky. But this Beau definitely knows hockey). Tonight Pens defenseman Brooks Orpik will play in his 600th-career NHL game, all with Pittsburgh. 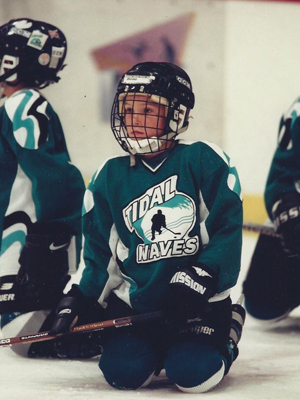 Orpik was the Penguins' first-round pick (18th overall) in 2000. He played in his first career game, wearing No. 29, on Dec. 10, 2002 at Air Canada Centre against the Toronto Maple Leafs. Orpik finished the game with 15:58 minutes of ice time and one shot on goal. Orpik is only the 7th player to appear in 600 games for the Pens. And among defensemen, only Ron Stackhouse (621 games) has appeared in more contests. Orpik will likely pass Stackhouse this season to become the all-time leader in games played by a Pens blueliner. Interesting note from Orpik's first-career game: Only five players that played that evening are still in the National Hockey League. Orpik, Alex Kovalev, Andrew Ference, Nik Antropov and Tomas Kaberle (Johan Hedberg was a backup in the game and did not play). Another funny point made by Orpik, one thing he remembers most of that evening was laying out Leafs' Tom Fitzgerald - who would later become his coach and is now the Pens assistant to the general manager. Bennett said following the morning skate that he will make his NHL debut tonight in Winnipeg. Head coach Dan Bylsma said Bennett will start the game on the left side with Sutter and Kennedy. 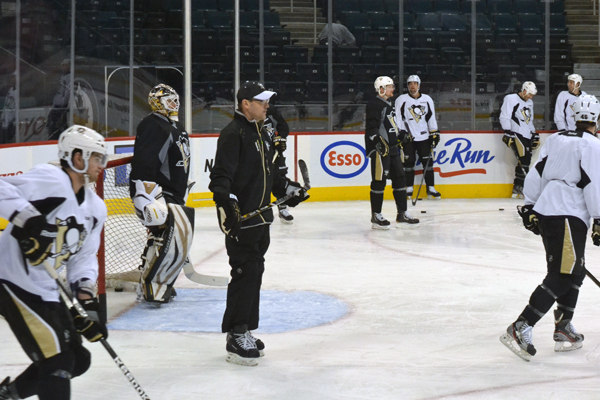 The Pens had an optional morning skate this morning. Only Sidney Crosby and James Neal didn't participate. 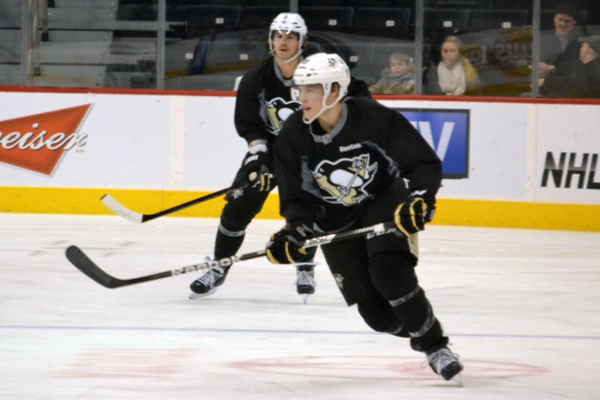 Evgeni Malkin and Brandon Sutter were back on the ice after taking maintenance days on Thursday. 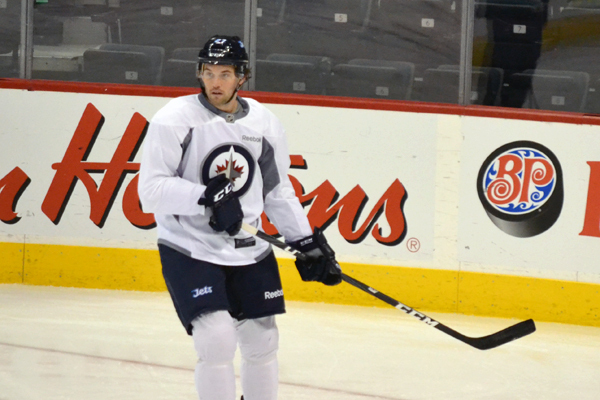 This morning was Tangradi's first skate with the Jets since he was traveling Thursday and couldn't make it to practice. He was swarmed by Pittsburgh media after morning skate, and as Sam jokingly said to him, "It's like you never left." If I just focus on playing my game and playing north-south, hopefully good things will happen. It’s not the number one thing in my head to score, but I’m just looking forward to getting an opportunity and playing my game. I think it was Wednesday (I was traded) but it feels like a long, long time. Wednesday I got the call and have had a huge smile on my face even to today. Yesterday was a long day of travel but no complaints here, I got a good night’s sleep and just ready to put on the Jets sweater and go to work tonight. 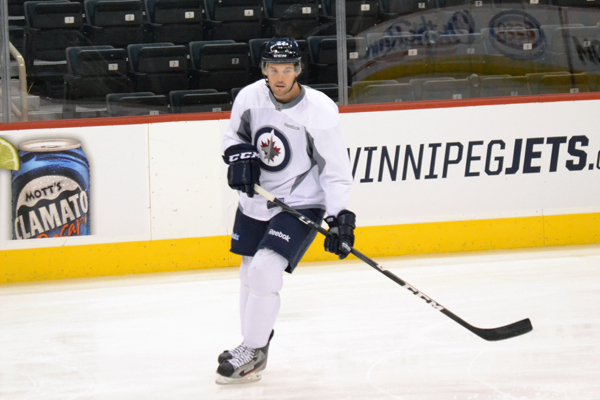 Former Pen Eric Tangradi skates with his new team, the Winnipeg Jets, at their morning skate. He's wearing jersey No. 27. The Jets got good news on Tuesday when defenseman Dustin Byfuglien returned to the lineup against the Flyers after missing the previous five games with an undisclosed injury. The big-bodied blueliner (6-foot-5, 265 pounds), who anchors the top pairing with Tobias Enstrom, has seven points in seven games and is a welcome addition back to their power play. The Jets may also be getting another talented big defenseman back in Zach Bogosian, who is day-to-day with a wrist injury and is a possibility to play on Friday. Those two plus Jets scoring leader Enstrom, who has 13 points (2G-11A), make Winnipeg’s blue line dangerous offensively. 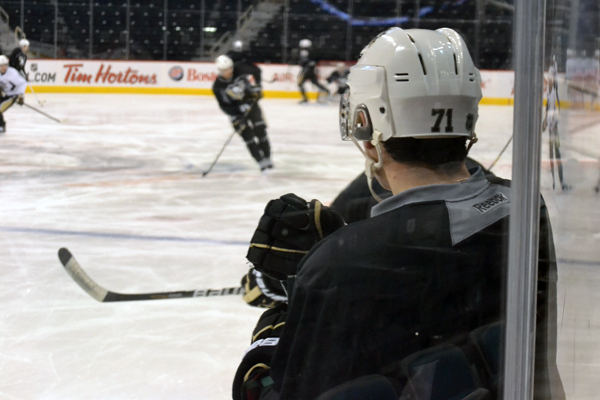 Today the Pens will hit the ice for a 10:30 a.m. morning skate (Central time) at MTS Centre. They’ll battle the Jets at 6 p.m. CT (7 p.m. Eastern). 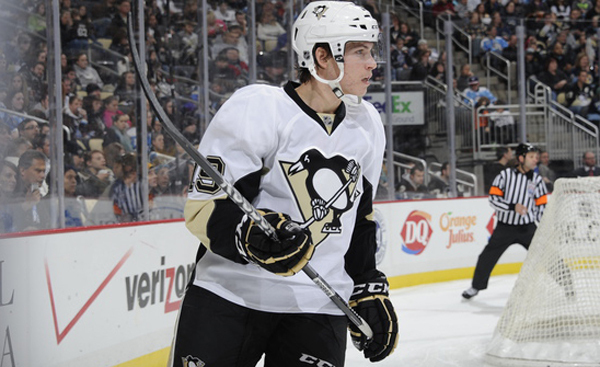 Winnipeg and newly acquired Eric Tangradi are scheduled to take the ice at 9:30 a.m. CT.